are pacifiers, plastic chain, rings and colorful cardboard rings. Lots to play with. This great little toy is made up of a string of disco beads, held together with small metal rings and small star beads, wavy wiggle rings and lots of colorful helicopter beads. On the end of the toy hangs two gel rings with a 22mm nickel plated liberty bell. 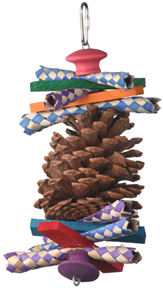 A 4-5" Ponderosa Pinecone with colorful finger traps and colored wooden slats top and bottom and topped of with colorful wooden mushroom beads. The slats on the toy are 4" long and 1" wide and 1/4" thick. 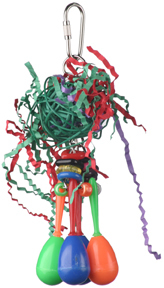 This great 2 string toy is made of colored disco acrylic balls with pony beads, jungle animals and wavy wiggle rings hanging from a large plastic C link. Sparkly and different. 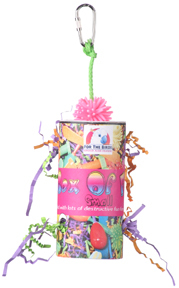 This very busy toy for small birds is made on multi-colored plastic chain. On the bottom hangs a colored plastic key and between the link on top and the key hangs 10 cute little toys on metal rings with pony beads on each side. Two kooshy frogs dangle from colored spiral shoelaces with a pacifier filled ball at the top. Larger pacifier beads and colored liberty bells sit at the bottom. All hangs from a nickel plated pear link. 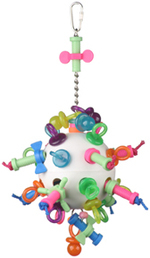 This toy is hanging on 2mm chain and has very sturdy smilie face cups, buttons, pacifiers and fat beads hanging on rings. It is busy and good for birds from Cockatiels to Quakers. 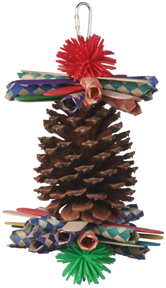 A huge Longleaf pinecone with lots of finger traps and tongue depressors and big cushy balls top and bottom. Perfect toy for Senegals, Greys, Amazons, Small Cockatoos, & Mini Macaws. This cute swing has cute little finger rings and mini shapes to keep your bird entertained while swinging. African Grey delight! It is held by chain and a large pear link and has tones of diamond pacifiers, ridged heavy plastic stars, angled beads and a key on the bottom. Hours of fun for Conures to Grey sized birds. A 1-1/2" munch ball with crinkle paper stuffed in it. Going through the middle if the munch ball are two pieces if 1.6mm chain with gel shapes on them and at the bottom is a 19mm ring with maracas and pony beads. It all hangs from a 12mm ring and a pear link. 1" birdie bagel and bells toy. 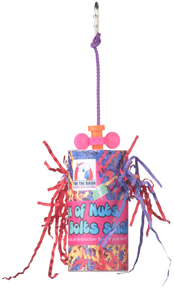 Colored bells are hung with nickel plated rings and the whole toy is hung with colorful plastic chain and a pear link. One the plastic chain we has a pony bead and two genie bottle beads. Great for Budgies to Conures. A colored base ball size whiffle ball with 19mm rings holding 48mm colored liberty bells and colored jumbo space beads. This toy hangs on bird safe nickel coated chain with a large jumbo bead on top and another colored 48mm liberty bell hanging in the middle. This small bundle of joy is hung on a metal chain with metal and plastic links holding butterfly beads, tri beads, pony beads a snowman bead, pacifier bead, pinky ring, small baby pin with facet bead, jungle animal and mini shapes. This cute toy has sparkle shapes, tiny bells and a bigger one on the bottom, mini shapes, snowman and small pacifier beads, mini plastic links, a pinky ring all on a metal chain. A special colored sturdy plastic coil with a small pear link at each end. On the coil hangs a nickel plated liberty bell, a couple of 1" colored beads, a couple of pacifier beads with shaped pony beads, a crazy shape in the middle, 1" colored finger rings and 1" colored plastic chain. A special colored sturdy plastic coil with a large pear link at each end. On the coil hangs a nickel plated liberty bell, a couple of large ABC blocks, a large pacifier bead, a colored baseball whiffle ball, colored donut shaped marbella bead and strip of 1-1/2 colored plastic chain. ​What a cute little tug and pull toy for small birds. It is held up with a colored plastic C link with two baby pacifiers hanging above the plastic ABC hard plastic piece drilled with two holes and a small bell and beads on the bottom. Higher up is the metal chain with two layers of small pacifiers and beads on both sides. The bird can play with the chain and pull it from side to side. This sturdy soft ball size whiffle ball is stuffed with nuts and bolts (held on with paulie rope) and 22mm pacifiers with a nut and bold hanging on the bottom of the metal chain along with a pacifier and large pony barrel beads. On the top of the toy we have two nut and bolts and more pacifiers. This toy is on metal chain with nuts and bolts, porcupine balls, barrel beads and pony beads all put together with metal rings and hung with a pear link. ery cute and all will love it. multi-colored plastic chain. On the bottom of the toy hang 3 metal strings of rings and pony beads. In the middle of the toy are two more rings tied together with a piece of vegetable tanned leather. another one above the bell. This sturdy hard whiffle ball is stuffed with nuts and bolts and pacifiers with a nut and bold hanging on the bottom of the metal chain along with a pacifier and pony beads. On the top of the toy is another nut and bolt and pacifiers. A string of the cute little rings with a bell on the bottom. This is a great little toy for Budgies to Conures. Hours of playing with these rings and tons of fun. A string of the cutest little rings with chunky finger rings with a large 48mm bell on the bottom. It is hung with 2mm chain and has large beads. This is a great toy for large Conures to small Cockatoos. Hours of playing with these rings and tons of fun. A cute little swing full of beads, and mini rings for hours of playing. On the bottom hangs two 1" pacifiers. Room on the swing for the bird to play with the beads. This great little carousel is made from two 2-1/2" big building wheels held on with a birdy bagel and paper sticks and flower beads. Metal chain holds a bell on the bottom and gel shapes and barrel beads on the top with a C link holding the toy. Animals are held on with little plastic shapes. Brightly colored round box stuffed full of colored crinkle paper, wood bits, pacifiers and plastic toys. 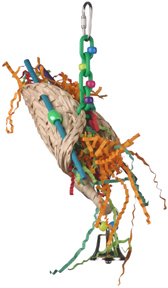 Hangs from a length of sisal with a large koosh ball attached to it. Lots of fun chewing, Birds love this challenge. 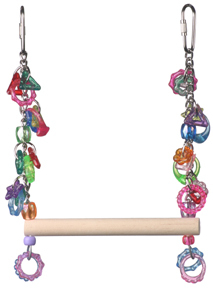 This great budgie swing is held with a colored C link, hanging on metal chain with mini rings on the top. 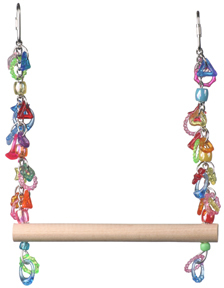 The swing has gem rings on the bottom with acrylic dice, pony beads, crystal pacifiers in layers and at the top a group of colorful mini rings and then repeating the same pattern down the other side. Two cute stars dangle from a chain adorned with bells and acrylic shapes. 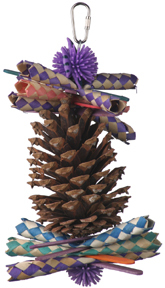 The 4-5" Ponderosa Pinecone has an small porcupine ball on the top and bottom. It has colorful popsicle sticks and finger traps on the top and bottom and is held with wire and a small pear link. This is perfect for Cockatiels to African Grey size birds. Great chewing and you can add treats in between the open leaves of the pinecone. A plastic disk suspended with poly rope decorated with many lengths of plastic links dangling down. The links are adorned with a plethora of pacifier beads and pony beads. A wonderful brightly (bird safe) painted little bucket stuffed with bright colored crinkle paper and lots of different little hand toys. Treats can be put in the bucket as well. This is a great, really busy swing for our little guys. It hangs with C links on metal chain totally filled with cute little finger rings and mini shapes. Two rings on the bottom of each side of the toy as well. Great whiffle golf ball with pacifiers, mini rounds, Jungle animals and pony beads. 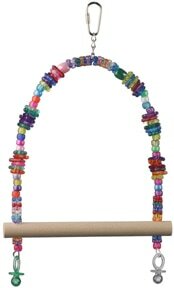 It hangs on metal chain with pacifiers on the bottom and a cute colored bead and mini rings on top. Tons of fun stuff to play with for the birds. Great colored, hard whiffle baseball with pacifiers, leather rounds, birdie bagels, plastic keys and large pony beads. 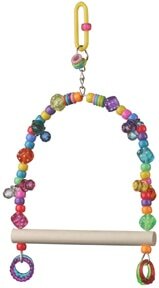 It hangs on metal chain with pacifiers and a bell on the bottom and a large colored bead and mini rings on top. Tons of fun stuff to play with for the birds. totally filled with pacifiers hanging with nickel plated chain and a pear link with pacifiers on the bottom. Around the middle of the Golf Ball every second hole has a plastic link with pacifiers and pony beads. 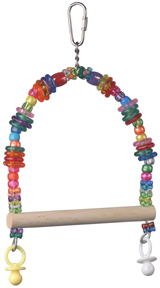 Bells and acrylic pacifiers hanging on a chain make this a fun toy your bird will love. Smaller Bells and acrylic pacifiers hanging on a chain make this a fun toy your bird will love. Nothing but chewing fun for our small to medium birds. This one was hard to define as to which category to put it in. It will be great for Quaker size to African Grey size birds. It is made with wire and welded chain, fat birdie bagels (really sturdy), supreme rope (bird safe), lots of bamboo finger traps, new beautiful wooden angle beads (they have 14 sides on them) and so can be chewed by all size birds. A string of gel shapes, pony beads, star beads and colored acrylic bunches of grapes. A full and colorful toy. This is a great stuffed natural fan folded and stuffed with paper for shredding and hung by colored 1" plastic chain with pony beads adorning it. We have combined 3 great 6" colored chewing sticks with barrel beads threaded thru and a great nickel plated 32mm bell on the end. This is simply fun for our birds, hours and hours of fun and can be stuffed with their favorite treat. Great chewing and preening fun. A smaller version of the original. Bells and pacifiers hanging on rings and a bell at the bottom. A joy for all small birds. with a fun bolt attached to it. Lots of fun chewing, Birds love this challenge. 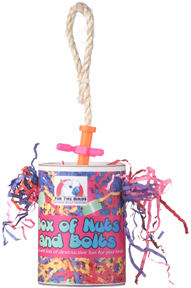 Box of Nuts & Bolts Large Brightly colored Round Tube stuffed full of colored crinkle paper, a porcupine animal and mini plastic fun nuts and bolts. Hangs from a Paulie Rope with a fun bolt attached to it. Lots of fun chewing, birds love this challenge.